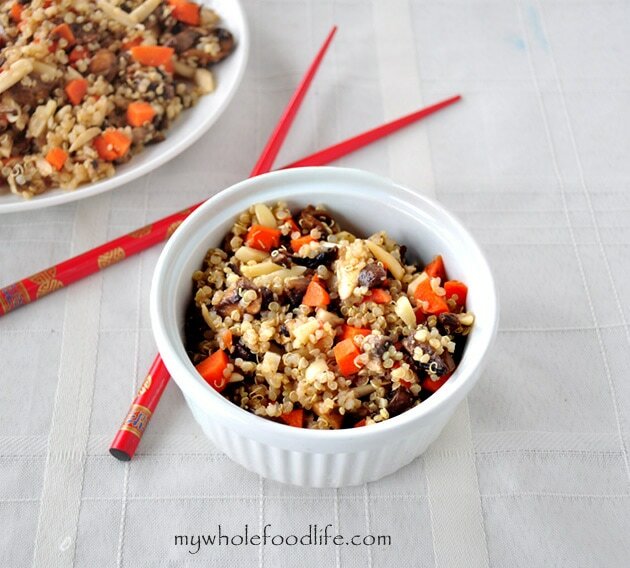 Easy Quinoa Stir Fry. Sometimes when money is tight, I have to cook from the ingredients I already have in my kitchen. I often make easy stir fry recipes. Many of those creations are not blog worthy though. However, I do get a winner once and awhile. This quinoa stir fry recipe was one of them. I always have quinoa in my pantry. I love cooking with quinoa because it’s not only a plant based complete source of protein, but it’s also gluten free. If you don’t care for quinoa, you can always use rice instead. An easy meal that can be made in under 30 minutes. In a saucepan , saute the onions, garlic, mushrooms, carrots and oil for about 5-7 minutes on medium heat. Then add in the cooked quinoa, almonds and balsamic and keep sauteing on medium heat for another 5 minutes or so. Lastly, add in the salt and pepper to taste. This should keep for about a week and a half in the fridge.